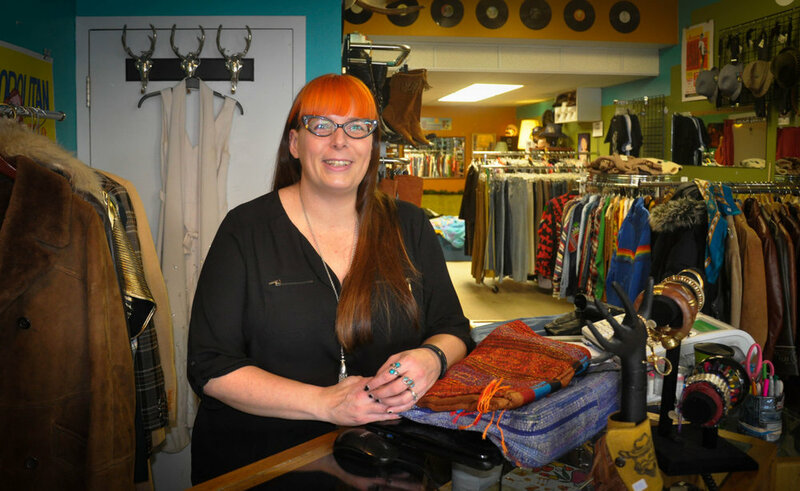 When Nicola isn’t playing stand up bass, she runs a vintage shop on 33rd. KC: How did you get into the vintage game? NT: I’ve always been fascinated by the “hunt” of shopping second-hand and finding pieces of history. I started collecting the best of the best and when I got laid off from my career job in 2010 I realized that my “someday” dream of opening a shop could become a reality, and decided to try it! KC: What are the best aspects of doing what you do? What are the challenges? NT: I feel like I was born to do this, finding and creating value in things that have been discarded. I love being able to travel to source my stock, I love hearing the stories that people have of why a piece is important to them, I love the freedom to create my brand, and I love being my own boss and making the rules. But owning a business is challenging in a lot of ways as well – you sure don’t always get paid and you can’t just walk away at the end of your day… it’s a 24/7 gig and you’re always thinking about ways to improve your business. KC: In what other ways are you creative? NT: I play a lot of music in and around Saskatoon and love dressing up & getting on stage with my band the Chickadees. This summer you’ll see me on the festival circuit with my double bass enjoying life and playing tunes. NT: In life? In business? Love is important. Connections are important. Honesty is important. I have made so many good new friends since opening my shop in 2012 that I’m so thankful for. I love when people are true to themselves and are confident, that’s the most attractive quality. KC: What do you like best about Saskatoon? What do you like least? KC: (from Proust Questionnaire) What is your most marked characteristic? NT: I would have to say that I’m certainly known for being honest and/or blunt. In my business I think it can be an advantage because I will not lie and tell you something looks great or fits when it doesn’t – I certainly don’t want to make a sale just to make a sale, I want you to love what you purchase and feel fantastic in it.